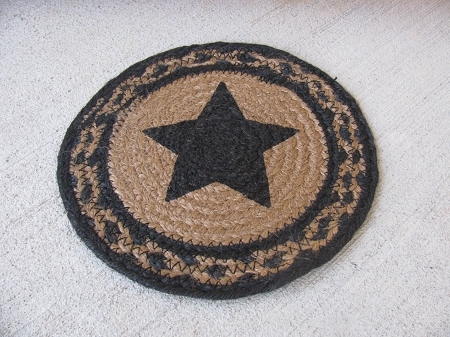 Primitive Farmhouse Star Black and Tan Braided Jute Trivet. I love the warmth black and dark tan bring to your home. I have it all over my house! This braided jute trivet is a great accent piece for sooo many places. Cabinets, table tops, shelves, kitchen counters and more! Use or decorate with! Black and tan coloring with star stenciled in the middle. Size is 8". Spot clean.